A traditional wooden freight train with a happy face. The cargo can be unloaded and reloaded and the railway cars sequenced in any way. A treat for that little someone who loves trains. London's famous guard the Beefeater, a traditionally crafted wooden stacking toy. Tear him down, put him back, a challenge to both dexterity and imagination, a good learning tool. 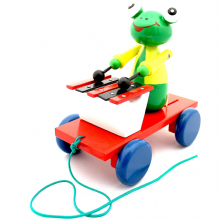 Traditionally made wooden pull toy, in vibrant colours. Animal playing the xylophone as the cart is pulled. Motion and sound, a sure way for little ones to have hours of fun . Traditionally made wooden pull toy, in vibrant colours. Pinocchio beats the drum as the cart is pulled. Motion and sound, a sure way for the little ones to have fun and enjoyment. London's attractions in neatly cut wood blocks: Big Ben, Tower Bridge, Westminster Abbey, Black Taxi, Red Bus and more. An enjoyable way to learn the famous sights of this famous town. 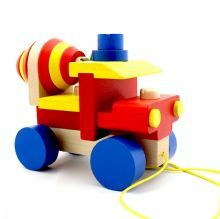 Unique bright coloured wooden tanker, has screws and a removable green screwdriver, for poking or making the "repairs", an excellent toy for a tiny engineer. The Constable in his distinctive uniform, a common sight in the streets of London. 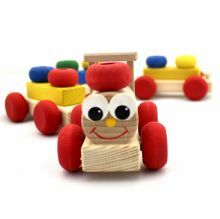 A wooden toy made the old fashion way, for a new generation.